If you have made a purchase from the TAW Shop, please fill out this form to get your "Swagster Tab"! The designs and products that are listed on the Shop pages for NA and EU are just templates, items that give a base look to the designs. Almost everything in the Shop is customizable to the way you want it. Make sure to keep an eye on our front page blogs for any upcoming or ongoing sale promotions! Q: Who gets my money? A: If you buy TAW merchandise, your contribution goes to our TAW Community Fund. These funds help us cover maintenance and running costs for all of our servers, allowing us to continue providing a safe and fun gaming environment to all of our members. A: The delivery time can variate depending on the shipping option you choose and the location it has been sent to. 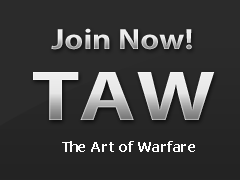 This information can be found at the bottom of the TAW Shop site by clicking the "help" link. Q: How much does the delivery cost? A: Delivery cost varies, but you can find more information on the TAW Shop site. Q: How do I submit a new design?